Two tourist information centers were put into service in Sanya Bay and Sanya Phoenix International Airport to better service international and domestic tourists. A total of 8 of this kind of facility have been placed across the major tourist attractions since October 2010. They are located at Dadonghai Square, the Pedestrian Street Center, the domestic hall of the Sanya Airport, Sanya Phoenix Island International Cruise Terminal, Tianyahaijiao Scenic Spot, Nanshan Tourism Culture Zone and Sanya Railway Station. To date, the number of visitors to these centers has totaled 107,422, of which 11,357 were international tourists. 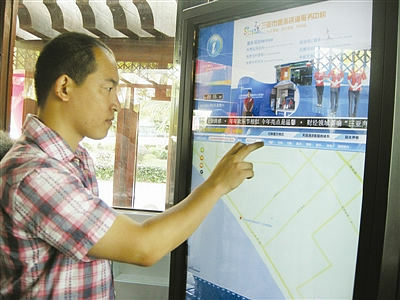 The intellectual guide system is divided into self-service guide touch screens, which are usually placed at public places such as hotel’s lobby, shopping centers, scenic spots and the airport, and fixed visitor information enquiry centers which provide a comprehensive round-up of the latest information on scenic spots, tourism-related products sales and updated tourism information released by the government.